The Angriest: Star Trek: The Next Generation: "Homeward"
It is 17 January 1994, and time for another episode of Star Trek: The Next Generation. 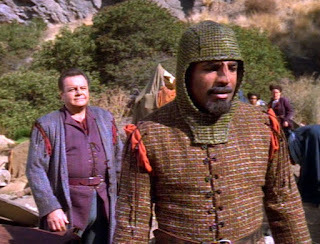 The Enterprise comes to the planet Boraal II to rescue Nikolai Rozhenko (Paul Sorvino), a noted Federation anthropologist and Worf's adoptive brother. Boraal II is suffering a total atmospheric collapse, killing the primitive population entirely - but Worf is shocked to discover his brother has broken the Prime Directive and saved an entire village from destruction. Another episode of Season 7 that deals with family: this time introducing the son of Worf's adoptive human parents the Rozhenkos. It illuminates Worf's back story a little more, as well as provides a strong personal link to the ethical and moral quandaries raised by the episode. This is not an out-and-out classic episode, but it's one that definitely provides an interesting story with some proper issues to discuss. The Prime Directive, an instruction to never interfere in the affairs of pre-warp civilizations, regularly hangs around Star Trek's neck during the Next Generation era. In theory it should open up story possibilities, but more often than not it just seems to get in the way. "Homeward" actually tackles the problem with the Prime Directive head on: the Directive would command the crew of the Enterprise to simply stand by and allow an entire humanoid civilization die with their planet. Nikolai, who has spent a long time studying them, refuses to stand by and let innocents die. He has stepped in among the peaceful Boraalans, and convinced them to hide in a set of caverns to survive the initial depletion of their planet's atmosphere. When he is ordered to leave them behind and let them die, he secretly beams them aboard the Enterprise's holodeck - they can live there until relocated to a new home, much to Picard's outrage. It is difficult not to side with Nikolai to some extent, since he is saving lives that Picard would otherwise let die. He may be breaking a world of rules, and ruining his career in the process, but damned if he isn't ultimately right. The Prime Directive can seem logical and appropriate on paper, but with lives on the line it seems ridiculous. Guest star Paul Sorvino plays Nikolai very well, and strikes up a solid chemistry with Michael Dorn. Among the Boraalans Brian Markinson is excellent as Vorin. A holodeck glitches sees him freed into the Enterprise proper and, seeing what the universe is actually like, chooses to commit ritual suicide rather than continue living. It is a sudden and unexpected plot shift, one quite unusual for Star Trek, and has a wonderfully sullen effect on Nikolai's insane plans to save the Boraalans without them even realising they were saved. "Homeward" is a strong and effective episode, something that has seemed in relatively short supply over Season 7's first half. We are now 13 episodes into the season - exactly halfway - and only seven have been good. The quality ratio hits 54 per cent. That hardly seems like a victory lap for the show's final year.